Would you like to sing with an improptu Chorus on Saturday Morning? The John Little Show is an informal Concert, prior to the main Competition on Thursday and Friday, aimed at giving competing Quartets a chance to perform, on stage, in front of a supportive audience. This is a great opportunity for competing quartets to hone their skills and has always been a great show to watch since it was first introduced at the Perth Convention in 2013. As an added bonus, our visiting feature Quartet from the USA, Crossroads may make a brief appearance. The John Little Show is being held this year on the Wednesday at 7.30pm in the Auditorium at Sydney Boys High School which is located at 556 Cleveland St, Moore Park. 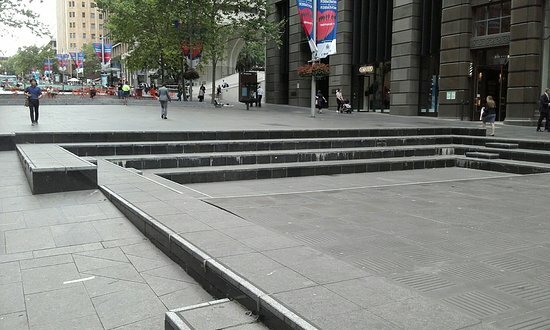 This can be reached by public transport (Light Rail/Bus) or a short taxi ride depending on where you were starting from. 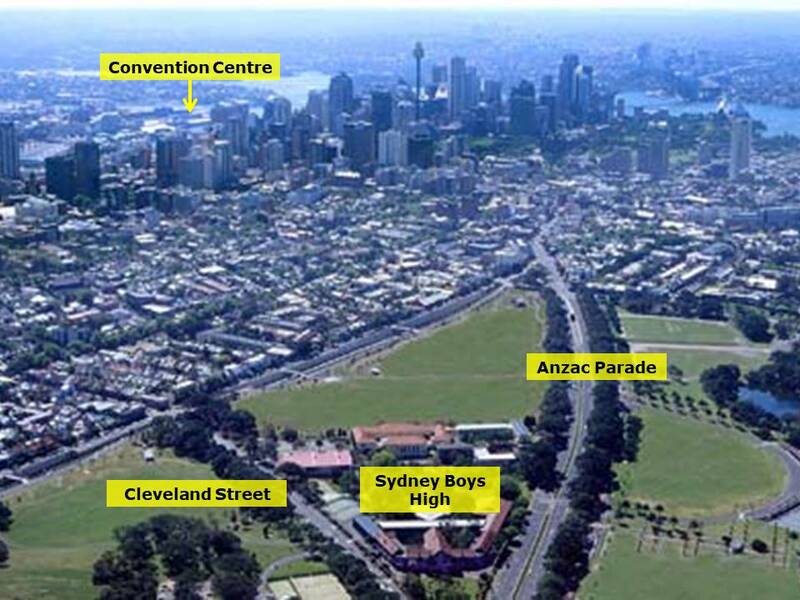 Sydney Boys High can be entered from both Cleveland Street and Anzac Parade. The Youth A Cappella Festival led by Deke Sharon, "the father of contemporary a cappella" is also being held at Sydney Boys High on the Tuesday and Wednesday. You could go over to the School early and catch the Concert at the end of the Youth Festival running from 4.45pm to 6.00pm (ticket required, see below). This would leave you an hour and a half to grab some dinner at one of the numerous nearby restaurants before returning for the John Little at 7.30pm. All registered Delegates to the Pan Pac Convention are eligible to attend the John Little Show. Non Delegates can enter by payment of a donation at the door. A Great way to start the Convention! 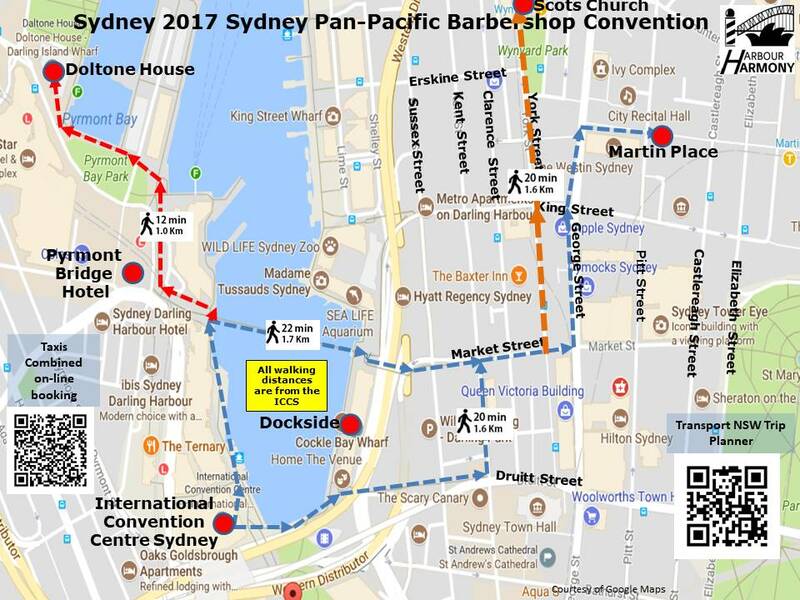 To travel from the Darling Harbour precinct, take the Light Rail from Convention Station adjacent to the ICCS to Central Station then take a 339, 374 or 376 bus. Overall travel time should not exceed 20 minutes and cost is around $5. To travel from the City, make your way to Museum Station and take the 396 bus. Please note: All travel on Sydney public transport is ticketless and requires all travellers to have an Opal Card pre-loaded with sufficient funds to cover the cost of the trip. Opal cards can be obtained from most Newsagents and other selected retailers. Each of the songs to be sung is listed below and will be directed by one of our very own Chorus Music Directors. Some of the best and most memorable times to be had during our Conventions is when mixing and singing with your fellow barbershoppers during the Afterglow gatherings following each day's activities. 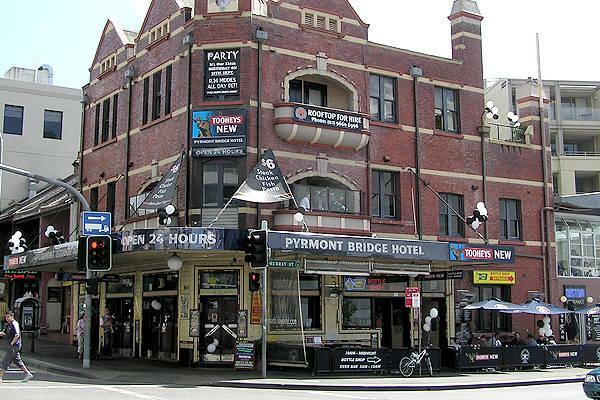 Informal arrangements have been made with the Pyrmont Bridge Hotel (see Convention map in article 1) to be the gathering point after the Welcome Gala Dinner on Thursday and the Quartet Final on Friday. No dedicated area has been allocated but we are assured ample room will be available for us on the 1st floor Terrace. They have also offered to discount drinks to anyone wearing a Convention Name tag. 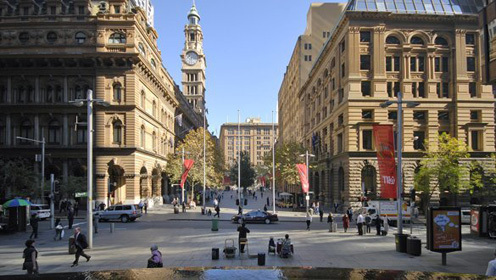 On the Saturday evening, after the Showcase of Champions, a bar will be open in the foyer of the Darling Harbour Theatre. When you register at the Convention you will receive, amongst other things, your Convention booklet. you may note on Page 7 of the booklet that it states all registered delegates will receive a separate ticket to attend the Showcase of Champions on Saturday night. Please note, this is incorrect. All registered delegates are entitled to attend the Showcase of Champions just by showing their Convention name tag to the door ushers on entry to the Darling Harbour Theatre. Please also note, their will be no designated seating at this Concert. 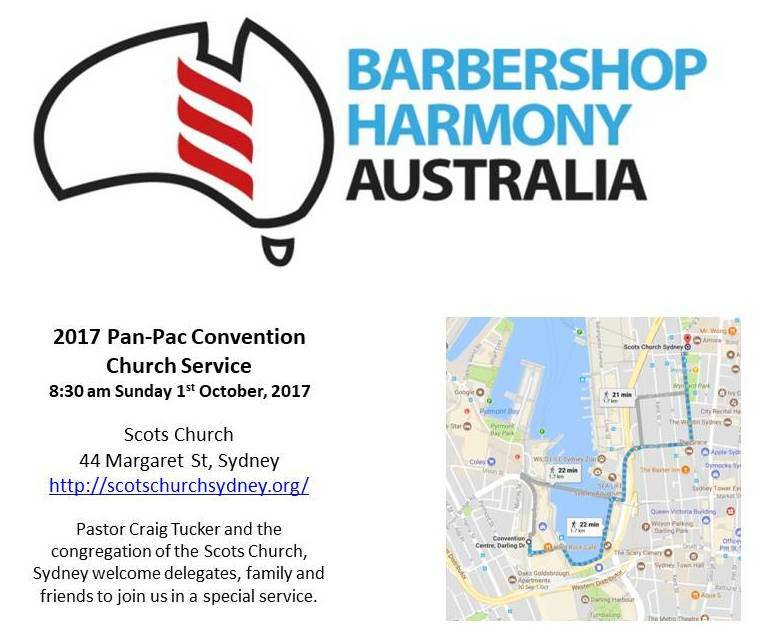 Please note that the Sunday Church Service was previously advertised as being held at St Andrews Cathedral in George Street Sydney, This has now been changed and the Sunday Church Service will be held at 8.30am at Scots Church which is located on the Corner of Margaret and York Streets in Sydney directly opposite Wynyard Park. Further details are as shown below. If you are not singing with a Chorus we are looking for singers who would like to sing for the chorus sound check on Saturday morning. Would you like the chance to sing on the contest stage? Those who are not singers in a competing chorus are encouraged to gather at 8:25am Saturday in the Darling Harbour Theatre for the sound check before the chorus competition. One of the songs sung during the Massed Sing will be chosen. Please email Vicki Donnelly ve_donnelly@bigpond.com if you are able to assist advising your name & contact details. Please ensure that you have all read the the relevant Contest Rules and the Contestant Information for Choruses and Quartets distributed to your respective Convention Representatives. If you have not yet seen this information it can be viewed on the Convention Website. Evaluation schedules will be confirmed with contestants closer to the time with venue details.